Leave a caption for this picture. In a day or so I'll throw the submissions into a head to head vote and the winner will receive bathroom lights a fantastic fake prize handpicked by me! On my way to get snow chains on my tires - the reindeer and elves went on strike. 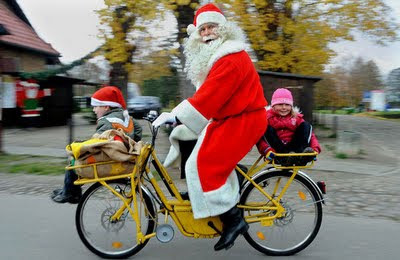 Lack of income to buy toys and the overflow of children lead Santa to deliver children instead of toys!! Sally asked for a baby brother and sister... this was the best I could do. Too heavy for the stork to deliver. In this damn economy I had to lay off the reindeer and couldn't rent that luxurious sleigh. But Thanks to these elves for volunteering to help me.. I may just make it to your house before the new year.